Get Critical! Arms Law is about FRP combat - the kind that leaves you shaking and bragging to your friends about your character's exploits. If you prefer safe, ho hum, by the numbers RPG combat, Arms Law is not for you. If you are loking for FRP combat that leaves you breathless, your quest ends here. 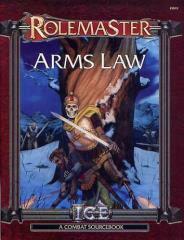 Arms Law is a fantasy combat system designed to be used with ICE's Rolemaster rules or the RPG rules set of your choice. Arms Law slides right into any other game system quickly and easily. What makes Arms Law special? Criticals and Fumbles. From the 'E' Puncture Critical Table: "Pierced through the heart he reels 10 ft. before dying...."
From the Two Handed Arms Fumble Table: "Stumble over an imaginary unseen dead turtle. you lose two rounds off attack, but can still parry." Arms Law includes 29 individual weapon attack tables, 13 special attack tables, and dozens of critical strikes, and fumbles. Remember... it's not the bruises that kill! Critical damage is what wastes your enemies.